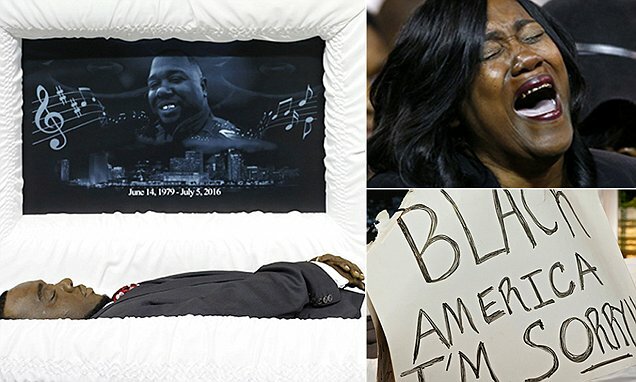 Alton Sterling's grief-stricken relatives broke down in tears as mourners walked past his open casket to pay their respects at his funeral in Louisiana today. Sterling, 37, was shot dead by two white police officers who pinned him down outside a convenience store in Baton Rouge where he was selling CDs. Today, hundreds of people flocked to Southern University to remember the father of five whose slaying sparked a wave of protests across the country. His aunt Sandra, still overwhelmed by his death ten days ago, had to be restrained by two men as she walked past her nephew's body. Among the mourners was Claire Carter, who came to Sterling's visitation inside the basketball arena at Southern University, a historically black college in north Baton Rouge. She, like so many others, said she wanted aggressive policing to end. Sterling's encounter with police 'went too far' when officers tackled him and used a stun gun on him, she said. Police have said they found a gun in his pocket. Sterling's funeral started with a gospel choir singing hymns, as many in the crowd of a couple thousand joined in. Gary Chambers, a spokesman for the Sterling family and master of ceremonies for the funeral, said at the beginning that the event was intended to be a celebration of Sterling's life - not an opportunity for demonstrations about his death. 'If you want to protest please leave now,' he told the crowd, which included two senior advisers to President Barack Obama. His son is a lawyer. As someone that really struggles with death after losing a lot of things to buy this? Come on DM, the family may have chose to have dinner with me tomorrow.